Giles was born in Athens, where he remained until his notoriety started to interfere with his prayer life. He moved to a location France near Arles to live as a hermit; that location is now known as Saint-Gilles. His diet consisted of little more than water, indigenous vegetation and the milk of a deer. Giles was at peace in his new home until, some 3 years later, one of King Flavius's hunts chased Giles' deer into the hermit's cave. King Flavius was so impressed by Giles that he insisted upon a meeting between Giles and the Bishop of Nimes. Soon thereafter, the Bishop built a monastery near Giles' cave and convinced Giles to become the abbot. 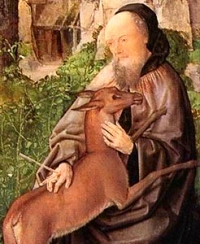 Images of St. Giles most often include a deer in a setting of or near a cave. St. Giles is the patron saint of beggars, breastfeeding, the disabled and the poor.